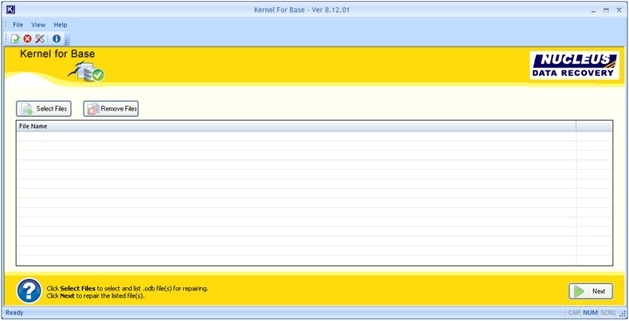 Kernel for Base is an OpenOffice Base recovery software which repairs .odb files of OpenOffice Base software. Successful recovery of tables forms queries data from the base databases. Software supports file repairing of any base database created with any version of OpenOffice Base software. Base database files which do not open due to database corruptions file errors media errors are repaired by the base odb recovery software. Software is available as a free download to its users where they can evaluate the software before purchasing it. Users can repair the corrupt database with demo software where the software will generate a recovery report file which will contain entire repair and list of recovered items which are recoverable. The generated report is the only file which is provided to the user. To view original file contents recovered with Kernel for Base user needs to purchase full version of the software. Supports Windows Vista XP 2003 2002 and 2000 with every version of OpenOffice.